In our previous discussions we came across a number of Java Implementation and Examples, in this particular blog we will see 'How to create a file in Java', 'How to rename a file in Java' & 'How to delete a file in Java'. We will use 'java.io.File' class to perform the create, rename and delete operations. 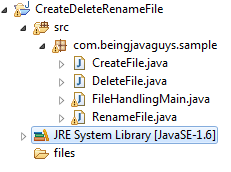 This is a simple java project with all code file to perform the operations, create a folder with name 'files' to store files and perform operations on. This is simple java class having a main method to start execution, implementation code goes here. Please make sure to use each operation one by one to see the implementation. In this particular blog we came across 'How to create a file in Java', 'How to rename a file in Java' & 'How to delete a file in Java'. In upcoming blogs we will see more about 'Java Handling' and Other Implementations in Java.